A Tonk's Tail... err, Tale...: Birthday Commentathon...and Giveaway! Happy Birthday Dear Allie! And many more...I'z got my jazz paws going for ya bigtime and wish you an awesome B-Day...we've never been to an official Kansas City-style barbecue before so that's very cool and so is your Commentathon for the Great Plains SPCA, hope it is very successful! Happy 7th Birthday Allie. It's very generous of you to have a barbecue for all your friends, and give some really good food to the shelter kitties. I just recently tried Merrick food and it's yummy. Chicken is always good...I think I'll enjoy a nibble of dad's handiwork. What a great birthday celebration. Merrick is one of our favorites, too. We know those shelter kittehz will love it! Happy birthday, Allie! What a great idea for a party and commenthon - and how cool of Merrick to help out! I haven't had the Purrfect Bistro food yet but Sparkle did and liked it! We mainly eat poultry flavors here, and usually don't eat fish flavors. A big warm happy birthday to you Allie and may your special day be one filed with treats and fun. Have a super Saturday. Happy birthday, Allie! The BBQ is a fantastic idea, as is the commentathon. We hope you're able to donate lots of green papers! Happy birthday Allie! May your brothers show you some respect today, or at least stay out of your stuff. Happy Birthday, Allie. What a great party and the commentathon is such a generous idea. If I win the giveaway, I would like you to give the case of food to the shelter kitties too. Happy birthday, Allie! I can almost smell BBQ here,,,mmm yum! Your garden is looking beautiful. Enjoy lovely autumn and fun fun birthday! We hope the commenthon will be a huge success! Happy Birthday!!! Hope you have many many more. Thr food looks wonderful, we here like tuna give us the fish! Otherwise it's chicken as a secom=nd choice. But we love tuna the most. Allie, I am so sorry I forgot to wish you a very happy 7th Birhday!! I love your Mom's blog. 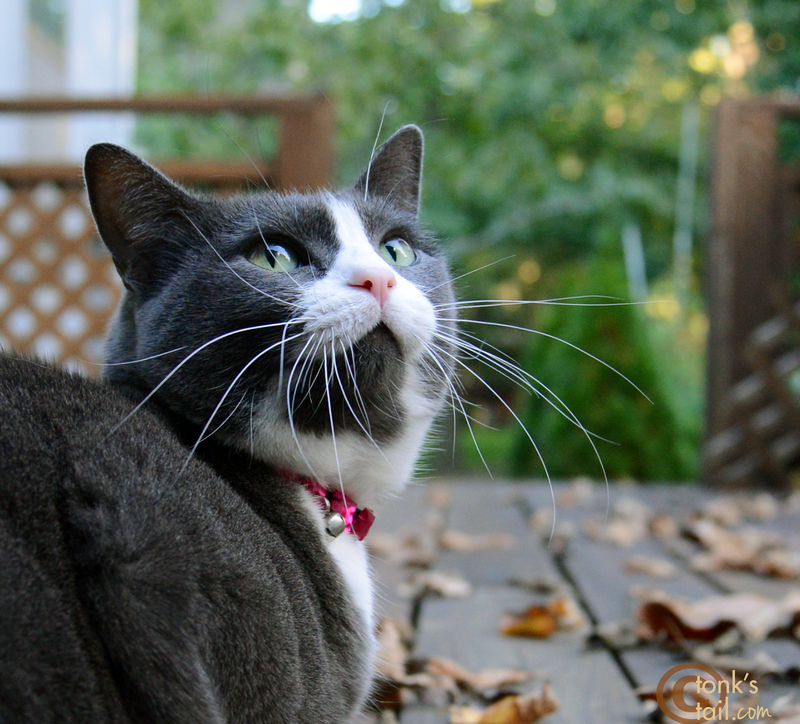 Her photography is clearly the most beautiful photos of cats I have ever seen. I always look so forward to seeing yours, Maxwell's, and Faraday's photos. And your mom always makes me laugh. Happy 7th Birthday Allie! Yummmmy BBQ! Mom wants us to bring her a "doggy" bag MOL! Hope you have many many more! Made a donation to Great Plains in honor of your Birthday! Happy 7th Birthday, Allie! Our mom sure does miss those Kansas City-style barbecues. Nothing better! Hope you get lots of comments for the kitties at Great Plains SPCA! Happy Birthday Allie! How wonderful that you are donating foods to the shelter. 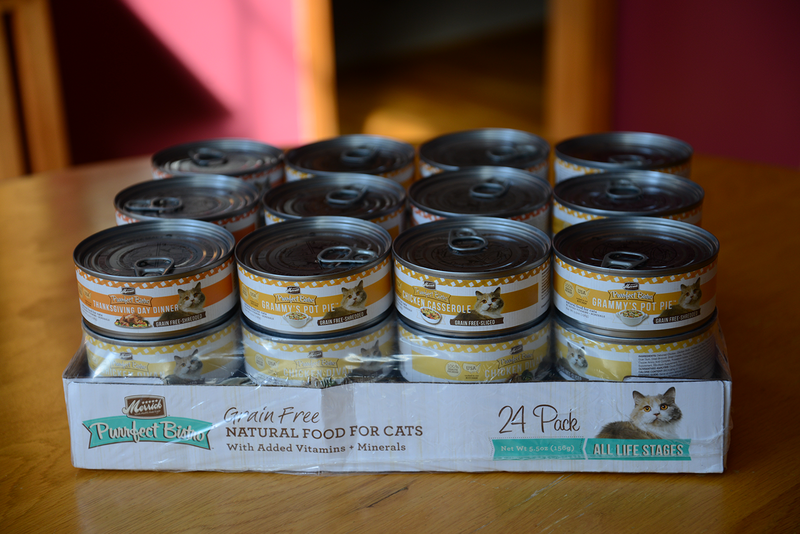 I know that the Farm cats love their brand new Merrick dry cat food that just arrived. So far they are eating the Salmon flavor. I have not opened the chicken yet. I have not given them the wet but I'm sure they'd enjoy any chicken kind. First of all, Happy Birthday (yesterday was my Treeing Walker Coonhound boy, Kenji's, 4th Gotcha Day). In addition to my five Treeing Walker Coonhounds, I have three cats, so we have a real house full! If I'm lucky enough to win the case of cat food, I'd like you to send it to the Great Plains SPCA with the case you're donating. I have three cats - they have 400 in need and I think they could use it more than my bunch could. Thanks for supporting rescue. Too many amazing dogs and cats die in shelters across the US every day. We need to do what we can to help. Again, Happy Birthday! Happy Lucky Seven! I know you will have a great year and that BBQ sounds to drool for! Merrick is the tastiest and also a very giving company! My cats eat our Merrick dog food when they manage to steal it, so I don't think flavor is an issue with them! How wonderful that you are helping out the Great Plains SPCA. What a fun way to do it too! ...and did you know that Merrick Purrfect Bistro is our FAVE?!!! Waffles especially loves Grammy's Pot Pie. From my dish. Everyday. Morning and night. Happy Birthday, Allie! Mommy misses her Kansas City barbeque! You do remember she grew up just north of Kansas City, don't you? And this time of year she misses the beautiful colorful bluffs. Thank you for your party, and I hope your special hungry kitties get lots of good foodies! P.S. If I win, please add to the foodies for your shelter, please? Happy Birthday, Allie! That sounds like quite a party! We would also like to enter the draw and offer the food to the shelter if we win. 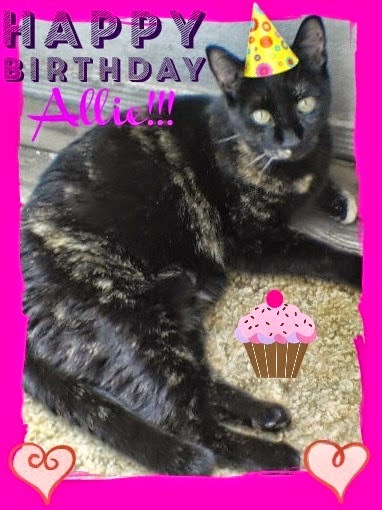 Happy Bird-Day Allie...There is an evil mousie running 'round in my walls disturbing me and mom so when I catch it I send it to yoo,sorry it not birdie for ur bird-day but.....well,dats life. Have a super duper wonderful day too! HAPPY HAPPY PURRSday Allie ! Happy Lucky Seven, Allie!!! We've never been to a Kansas BBQ, and our mouths are watering! Happy Birthday Grrrlfren’. You still look like a kitten. Heh. Look at those shiny furs. I hope I win the raffle since TW is now feeding a couple of feral cats in our hood. I like the Surf & Turf or Tuna Nicoise. TW says sometimes I’ll eat one and sometimes I’ll eat the other. Happy birthday from me and Lee! If I win the cat food, I'll donate it to Great Plains too! Happy birthday, dear Allie! What a special and generous way to celebrate your special day, sweet girl! Happy Birthday, Beautiful! I was *going* to wear a nice blue shirt in honor of the occasion, but . . . well . . . I wore my orange and black instead ;-) Humm Baby! Ooooh, this is turning into a regular War of the Wild Cards, eh? We say it will go seven games! Happy happy birthday Allie! What a wonderful idea having a commentathon! My kitties love about every kind of cat food, but unfortunately we can't have any with fish in it; Leo can't eat fish because he previously had crystals. Happy Meowday bootiful Allie. Hope yous day wuz purrfect and yous got all yous evew wanted. Happy Birthday Allie! That is great that you are having a commentathon. I know I am not in the USA but can I still enter the Merrick giveaway? If I were to win I would like it donated to Great Plains. Allie I hope you have an incredibly SWEEEEEEET birthday!! I love commentathons with a cause and this is a good one. We hope your Mom and Dad have to send LOTSA green papers to Great Plains. The BBQ was delish and the princess cookies were too! Enjoy yourself...you deserve it! OH MY COD! Mom failed to surf yesterday and we are tardy to your party! We may never forgive her! HAPPY (BELATED) BIRTHDAY to you ALLIE!!!!! A very happy happy (belated) birthday Allie. Mom's been away from the computer for a few days. If we won and we would love to try the Beef Wellington! Happy belated birthday, Miz Allie! Mommy's been working a lot, earning extra green papers, and we would rather she cuddle with us rather than surf the internets. We hope it was a terrific one and if we were to win, please donate it to the shelter. Mommy shops for our local shelter every Christmas and donates in our names. We want duck pate! It's the only kind EK will eat. Isn't he weird? Happy belatelyed 7th Birfday, Allie! Happy belated 7th birthday, Allie! We don't have leaves falling here yet. This far south in Florida, the trees panic in January and drop their leaves all at once when they realize they're late again. If we win the drawing, could we donate our case to Great Plains SPCA? We know they have a lot of need, and we would rather know they had the extra meals. Happy Birthday, Allie from Gus, Pearl, and Jaq! Gus and Jaq think you are lookin hot this days! They wondered if you are dating anyone. My 6 foster kittens (Gucci, Armani, Valentino, Prada, Meowmi Campbell, and Clawdia Schiffer) say happy birthday too! They wanted to tell you thank you for donating the canned food to Great Plains SPCA. They will be going there next week for their surgeries and then to be put up for adoption. They will be very appreciative of any donations. If the kittens win they want to take it back to the shelter with them and share with their new friends. Happy Birthday Allie! My kitties would love the Purrfect Bistro Tuna Pate. Happy Belated Birthday, Allie! We are so sorry we missed it. Sending lots of love and purrs! Hope it was the best one yet.